To welcome the summer season, Hutchinson Shores is offering the Summer Sunsation program, perfect for guests and nearby residents seeking a quick escape. From Sunday-Friday through September 30, 2018, guests enjoy the Summer Sunsation package, which allows spa guests the option of two 50-minute treatments for $169. Guests can choose between a Swedish Massage, Custom Facial or Scalp & Reflexology session. The Summer Sunsation special can be reserved by calling 772.402.9214. Nestled north of Palm Beach on Florida’s east coast, Hutchinson Shores Resort & Spa is recognized as a AAA Four-Diamond property. With a signature Spa, two pools and cabanas, oceanfront Drift Restaurant + Bar, Reflections Pool Bar and Dune Beach Bar, the resort boasts 8,000 sq. 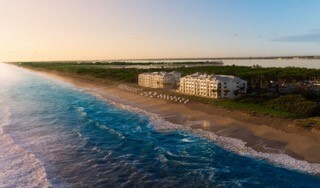 ft. of meeting and event space and endless beachside activities. Positioned near the iconic museums and attractions of downtown Stuart, Hutchinson Shores allows guests to craft an inspired Old Florida journey.